Good morning! 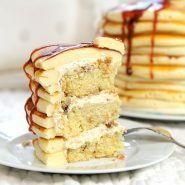 This cake is for the breakfast lover, it tastes just like a stack of fresh pancakes. Pair it up with a batch of maple syrup-flavored buttercream and candied bacon! Yum! This recipe makes three 6"x2" cake rounds or two 8"x2" cake rounds. Place bacon on a wire rack over foil-lined baking sheet, brush the top of bacon with maple syrup and sprinkle brown sugar on top. Bake in a preheated oven 400ºF/200ºC for 15 minutes. Flip bacon on wire rack, brush maple syrup on other side and sprinkle brown sugar on top. Bake for another 15 minutes or until desired level of crispiness is reached. Once removed from oven, place on parchment paper and flip often until cooled to prevent it from sticking. Preheat oven to 350ºF/175ºC. Grease three 8" cake pans with cake goop. Add in your eggs ONE AT A TIME. Let mix a full minute after each addition of the egg before adding the next. Add your flour and milk in alternating in thirds. Start with 1/3 of your flour, let combine, then add in 1/3 of your milk, then flour, then milk, then flour, then milk. Mix another 15 seconds to combine. Divide into three 8" pans. Layers will be a little shorter than normal so you have more "crunch" from the browning against the pan and adds to the flavor of the pancakes. You can also use two 8" pans if you want taller layers. Bake for 20 minutes or until a toothpick inserted comes out clean. Let cool and ice with easy buttercream combined with a tsp of maple flavoring and your chopped up candied bacon. When torting cake, melt butter in a small bowl and brush it onto each layer to infuse butter flavoring into pancake cake.